The past few weekends, I have taken my adopted greyhound Zoe to a local beach to cool off. She likes laying on a blanket and rubbing her nose in the sand, although she is afraid of the waves. 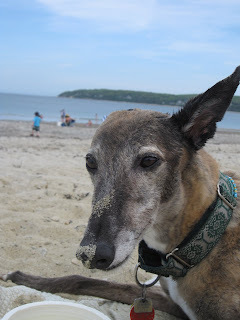 Sadly, summer is not this kind to all greyhounds. At dog tracks throughout the country greyhounds continue to race, even on the hottest days of summer. For example, greyhounds raced last night at Tucson Greyhound Park, despite the fact that it was 104 degrees when the races began. In doing so, the track and the Arizona Department of Racing ignored a letter we sent to them in which we asked that they cancel the night's races. To underline our concerns, we included a Heat Advisory that had been issued by the National Weather Service. On the previous night, the track only held four races before cancelling the remainder of races that had been scheduled. That was the right thing to do, but it raises an interesting question: why would the track do the right thing one night, but then turn around and put greyhounds in peril a day later? It is also mysterious that the management of Tucson Greyhound Park has removed the official results for June 27, the day in which they did cancel some races, from their website. We have filed a public information request for state records related to those races, and it will be interesting to see what documents we receive. I am disappointed that state regulators and track officials opted to go ahead with a full racing schedule last night in Tucson. Once again, they proved that the greyhound racing industry puts profits ahead of the health and welfare of its canine participants. Temperatures that high are dangerous to people and animals. There should be guidelines in place determining when the temperatures are too hot to race. TGP did the right thing one night, and they should do the right thing every night, for the good of the greyhounds. Would anyone in their right mind even consider keeping their dog outside in this kind of weather? Just another example of the lack of common sense and indifference to the animals' welfare the racing industry in famous for. SHAME !!!!!!! !